This no knead bread is very easy to make, just mix all the ingredients a day before and keep it a warm place atleast for 12hours.You dont have anything to do,there is no kneading for hours, the yeast will take care of it. This no knead bread is a routine now in my home, yes am baking atleast thrice a week. Now we are having freshly baked wheat bread for our breakfast to kick start our day.Nothing can be easier as like this bread, very easy bread to bake anytime of the day at home with simple ingredients especially without any preserves. 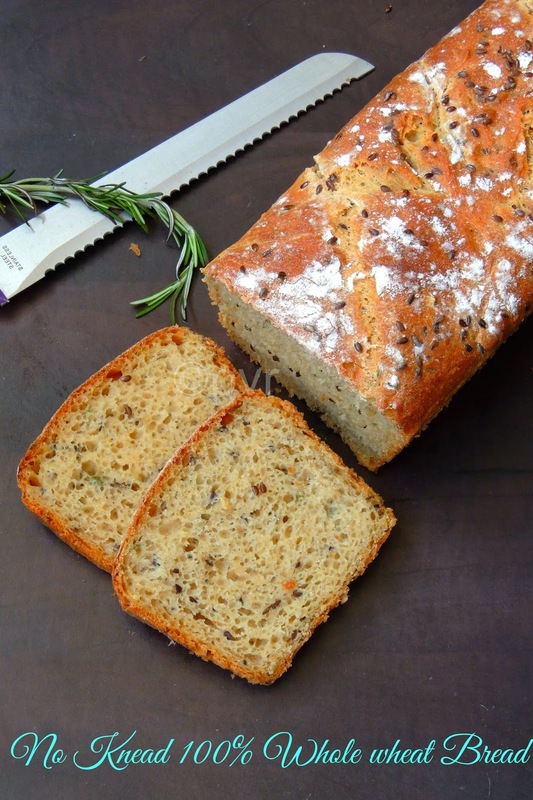 To make this no knead 100%whole wheat bread more healthier and aromatic, i have added some flaxseeds and chopped rosemary sprigs, this bread slices suits very much prefectly for making sandwiches. Not to forget that this bread stays simply prefect more than two days in room temperature if they are conserved properly. 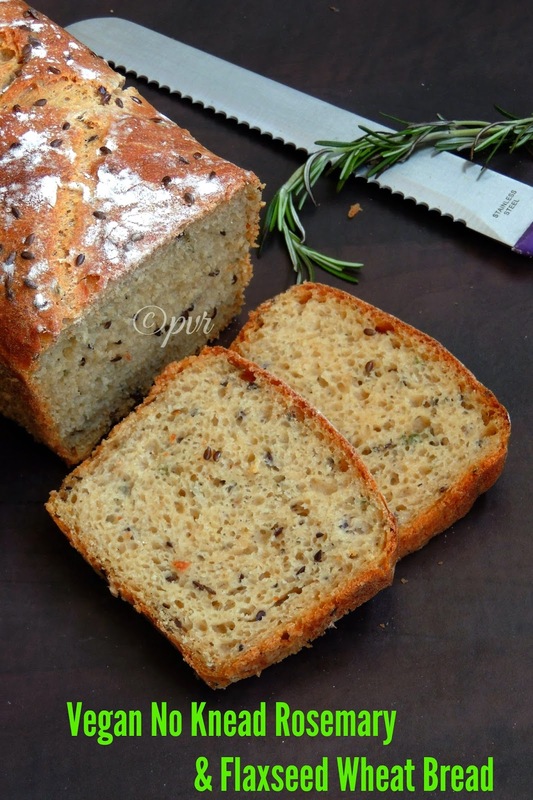 If you dont have flax seeds, or rosemary sprigs, just play with any seeds or herbs available at your place, even chopped curry leaves works tremendous in this bread,just go on and make your loaf happily at home. Take the flour in a large bowl, add in the sugar,salt,yeast,flaxseeds, rosemary sprigs, chilly flakes, pour in the water and oil. Whisk everything well until all the ingredients gets mixed together, dont knead. Grease your palm and spread over the top, cover it with plastic wrap and keep in a warm place overnite for 12-14hours. Next day, bring together the doubled dough by pushing the dough all the way to fold over the top. Meanwhile grease a loaf pan generously, fold the dough in half,lift it and drop it into the loaf pan. Smooth the top with oiled hands, using a sharp knife, cut the top of the dough three times to score. Sprinkle the flaxseeds, flour,cover it again with a plastic wrap, let it sit in a warm place for an hour or until the dough rise. Preheat the oven for 375F for 15minutes. Arrange the loaf pan in the center of the oven, bake for 40-45minutes, if the top browns too much, cover it with a foil. Cool the bread completely in a wire rack before slicing.. 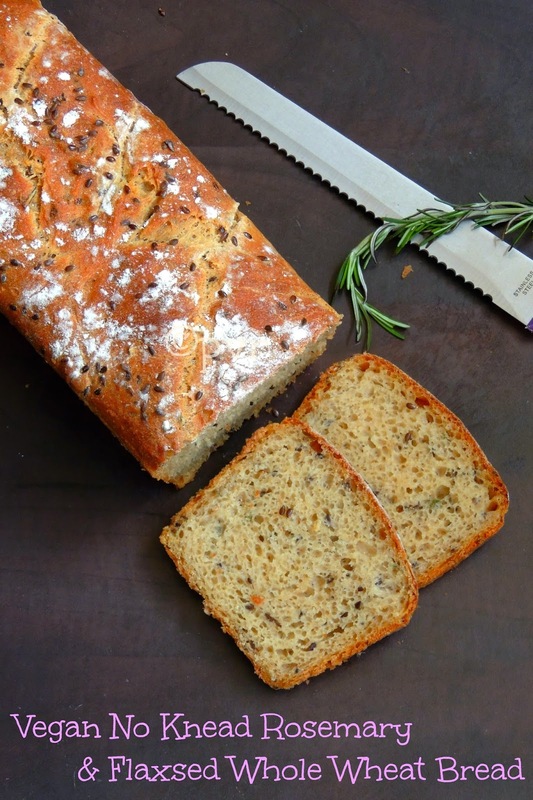 Enjoy with your favourite spread or make sandwiches out of this herbs and seeds loaded bread slices. hmm.. soft, healthy healthy bread.. yumm.. Wow!! !I'm in love with this bread..look so amazing..flavorful,healthy and delish...stunning pic dear..
Lovely flavorful bread...... Perfect healthy one!! I love bread that needs very little attention love the flavours you have added. Love the idea of flax seeds.. so healthy! It has been a long time I heard about these no-knead doughs and this bread is looking super delicious! Hi, bread looks very inviting! Thanks for sharing the recipe. May I replace instant with active dry yeast and what should be the quantity pls? Thanks! @Ruchi Choudhary if you are using active dry yeast you have to use warm water to proof the yeast .1 tsp of instant yeast = 1.5 tsp of actve dry yeast, hope this helps. Hi Priya, this receipe is really yummy and healthy, I want to try it once, could you please tell me the flr measurement in gms ? I do not use cup but have a measuring mug ... is 1 cup euqals to 150 gms? so will the yeast proportion will, 1 tspn for be 3 *150 gms ? Hi priya, yummy receipe ... would surely want to try. Could you tell me flr to yeast proportion in grams? I do not have measuring cups but measuring mug with grams marking. Never used yeast before thats why I am not sure how much to use? Shraddha Gundewar, the cup am using is 125grms, so for four cups its 500grms flour. If you are using instant yeast,1tsp yeast is equal to 3.15grms of instant yeast, in case if you are using active dry yeast its 4.25grms of active dry yeast.